Service is returning to normal on the Eurostar after a fatality on the line caused the high-speed rail company to suspend trains. Services were cancelled after the incident at about noon between Ashford International and Ebbsfleet International stations in Kent. With the line between the two stations closed, Eurostar was forced to halt services between London, Paris and Brussels. The Southeastern train company's high-speed Javelin trains which use the HS1 high-speed line were also unable to run between the two stations. 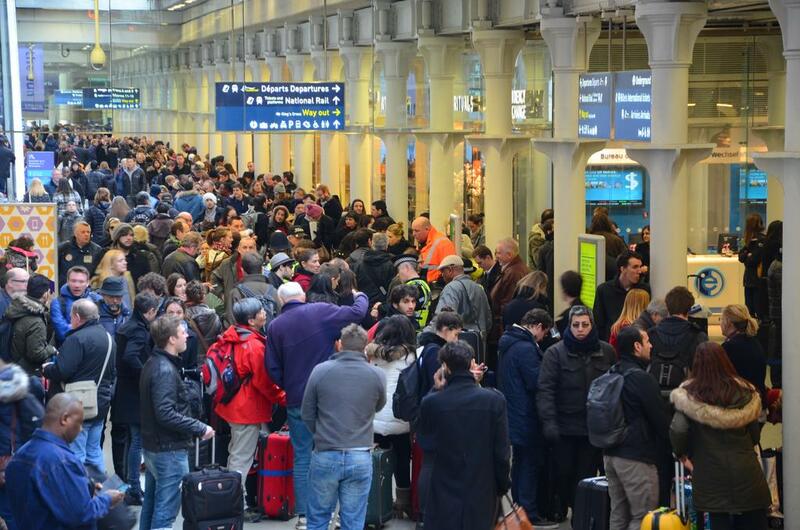 A Eurostar spokesman confirmed the lines have reopened and trains are back in operation for the remainder of the day. With the line between the two stations closed, Eurostar halted services between London and Paris and Brussels. The Southeastern train company's high-speed Javelin trains which use the HS1 high-speed line, were also unable to run between the two stations. Eurostar said it hoped to resume services later today. Services run by Eurostar have been suspended after a person was hit by a train. The incident happened around 12 noon between Ashford International and Ebbsfleet International stations in Kent. Heathrow Airport has moved to reassure passengers after the government enforced additional screening on passengers arriving from Ebola-affected countries in west Africa. In a statement, the airport said it was working with the government over the new measures but noted official UK guidance still indicated "the risk of a traveler contracting Ebola to be low". The welfare of our passengers and colleagues is always our main priority and we are working with Government to support the implementation of the additional screening measures. We would encourage anybody with individual questions or concerns to refer to guidance from the Foreign Office and Public Health England. The government's Chief Medical Officer has said she thinks it is "right" that the UK takes extra screening measures to prevent the spread of the Ebola virus. Professor Dame Sally Davies said: “Although the risk to the UK remains low, in view of the concern about the growing number of cases, it is right to consider what further measures could be taken, to ensure that any potential cases arriving in the UK are identified as quickly as possible." She added that rapid access to healthcare by anyone infected with Ebola was key to reducing the risk of transmission to others. Downing Street said they had been advised by Dame Sally "that enhanced screening arrangements at the UK’s main ports of entry for people travelling from the affected regions - Liberia, Sierra Leone and Guinea - will offer an additional level of protection to the UK." New UK Ebola screening taking place on passengers arriving from Liberia, Sierra Leone and Guinea could involve medical assessments, Downing Street says. On the advice of the Chief Medical Officer, initial tests will assess passengers' recent travel history, who they have been in contact with and what their onward travel arrangements are. There may also be a "medical assessment, conducted by trained medical personnel rather than Border Force Staff", a statement said. Passengers will also be given advice on what to do should they develop symptoms later. George Osborne has said there are no plans yet to screen arrivals at British airports for the Ebola virus. Speaking to the BBC the Chancellor said: "If the medical advice is we need to screen, and it might well be, then we will absolutely take that action." "We're not going to do anything that puts the British population at risk, indeed quite the opposite," he added. Channel Tunnel travellers are experiencing a second day of disruption following Monday's overhead power line problem. A spokeswoman for the Port of Dover said it was "working hard" with ferry companies to help get Tunnel traffic across the Channel after disruption was caused by a broken down train. The port continues to maximise available capacity for the additional traffic whilst maintaining a first class service for customers already heading to Europe's busiest ferry port. "The port continues to monitor the situation closely, in liaison with its ferry partners. Freight traffic entering the port is currently heavy, due to the issues at the tunnel. Tourist traffic is flowing freely into the port but passengers are advised to allow extra time for their journey." Engineers are still working to try and restore power to a part of the Eurotunnel. It comes after overhead power cables were damaged earlier today. A spokesman for Eurotunnel said this evening that engineering work will continue until 6am tomorrow morning, when the tunnel will partially reopen. Eurotunnel and Eurostar services have been badly disrupted. See the Eurostar.com website for more information on the delays.